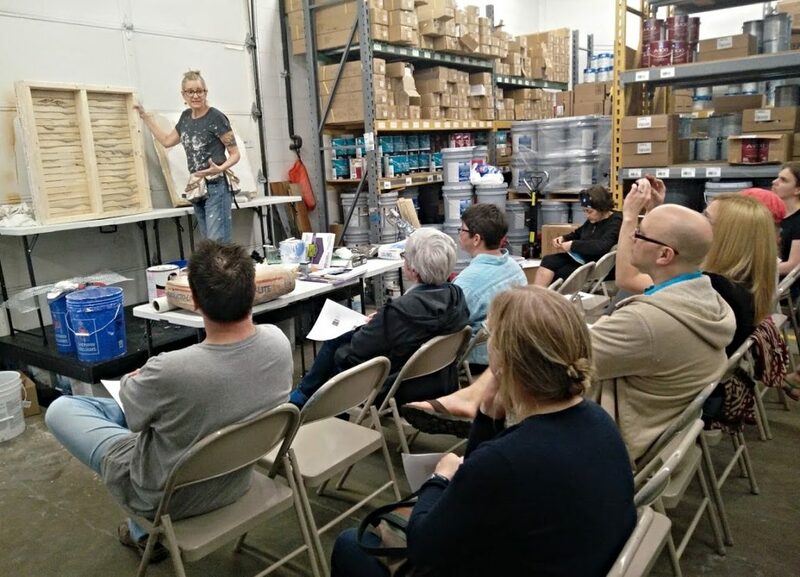 Plaster is a popular topic for homeowners these days, as evidenced by our latest home maintenance workshop. A sellout crowd of more than 30 attendees participated in “Knowing Your Home: Plaster Repair & Replacement” on May 10. Linda Jancik led an insightful presentation at Sherwin-Williams Lakewood. Hosted by our friends at Sherwin-Williams Lakewood, this free workshop featured an informative presentation by Linda Jancik of Wall to Wall Transformations covering all things plastering. Linda delved into everything from the benefits plaster walls afford a homeowner to the proper procedure for mixing and applying plaster. While plaster typically proves messy and time-consuming to work with, it does afford homeowners a variety of benefits. Plaster walls and ceiling tend to be more sound-proof and mold-proof when compared to alternative materials, and plaster also provides fire protection because its core is virtually non-flammable. In preparing a cracked ceiling or wall for plaster repair, open the crack up with a utility knife into a “V” shape, cutting back the sides. Brush out any loose plaster. For larger holes, remove broken plaster lodged between lathe. If the stud is visible, secure the lathe. Brush plaster weld into cracks and coat wood lathe with it. This will lock down any remaining debris and increase adhesion of new plaster. When mixing plaster, do so gradually. Mix it drier as first then work to add additional water as your mix progresses (it’s okay to use your hand as a mixer if necessary). Your plaster should have the consistency of soupy sand. A plaster mix product like Structo-Lite has a drying time of 45 to 90 minutes, thereby allowing you time to get your patch set and clean your tools. Make sure to wear protective eye wear to protect yourself from splatters and drips. It’s important to note that most plasters must be applied in a single application. Once ready to apply fresh plaster, fill holes while pushing plaster in all directions. Trowel back to level with surrounding plaster. There should be no high points, as this plaster is impossible to sand down. It’s okay to have depressions because these can be filled in with subsequent layers. Once satisfied with the application, remove the excess plaster from around the hole with a putty knife. Put simply, plastering takes time. Once applied to a surface, it must dry all the way through or else you could potentially suffer from plaster failure. Consequently, it’s strongly recommended to let your plaster dry for at least 24 hours following application. Depending on the size and depth of the hole and the humidity level, fresh plaster may take up to three days to dry fully. Not to worry, your finished product will be worth the wait.